There are several options for anesthesia for patients undergoing hand surgery. These include local anesthesia, regional anesthesia, or general anesthesia. The type of anesthesia used depends on the nature and duration of the surgery, patient’s health and medical conditions, and preferences of the patient, surgeon, and anesthesiologist. You and your doctors can decide together what method is best for you. “Local anesthesia” typically means anesthesia for a small area. With this type of anesthesia, numbing medicine is injected at the site of surgery. For more information, see Wide Awake Hand Surgery. Other medications to let you relax can be given as well with this type of anesthesia. Often the relaxing medications are administered through an intravenous (IV) line. Regional anesthesia puts part of your body to sleep by injecting numbing medicine through a needle placed along the path of nerves. This may be around the collarbone or neck, under the arm, or through an intravenous (IV) line in your arm. There are several different types of regional anesthesia. Sometimes an ultrasound machine or nerve stimulator is used to assist in finding the proper placement for the needle. As with local anesthesia, the anesthesiologist or nurse anesthetist may supplement the block with relaxing medication administered through an IV line. Some of the proven advantages of regional anesthesia include better postoperative pain relief, less need for post-op narcotic use, faster recovery from anesthesia, less nausea, and, for some surgeries, less blood loss and less risk of blood clots. Is Placing the Block Painful? The injection of numbing medicine with a needle can be slightly uncomfortable or painful, but you will have IV medication to help you relax and feel comfortable during block placement. Often times a small amount of local anesthetic is injected around the site where the block needle is to be placed. The anesthesiologist may use a needle connected to a nerve stimulator to precisely locate the nerve. This causes the arm or hand muscles to twitch and move, which is not painful, although it can feel strange. Placing the block usually takes around 5 to 15 minutes. The numbing medications used in regional anesthesia can provide from 1 to 24 hours of pain relief, depending on the specific medication used. The muscles controlled by the nerves that are blocked may also be weak until the block wears off. You will be given back-up pain medicine by mouth or by IV, in addition to the numbing medicine in the block. Having regional anesthesia means that the part of your body that will be operated upon will be numb during the surgery. Some patients prefer to be awake during surgery. Others prefer to be asleep. During your surgery you can be as awake or as asleep as you and the surgical team (surgeon and anesthesiologist) decide. Sometimes general anesthesia is recommended as well as the regional block. Your anesthesiologist will discuss this with you before the surgery. You will not be able to see the surgery itself because a large sterile drape is placed between you and the surgeon. This is to protect the “sterile field,” the important area of your surgery, from any contamination. As with any anesthetic, there are risks associated with the benefits of regional anesthesia. These include incomplete pain relief, soreness or bruising at the needle site, or tingling that lasts for several days. Serious complications can occur but these are very rare: significant bleeding, infection, or nerve injury. Your surgeon and anesthesia provider will check to make sure you are comfortable before, during, and after the procedure. Do not hesitate to tell them if you are not. 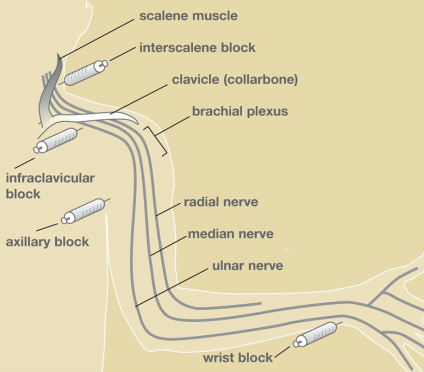 The interscalene, supraclavicular, infraclavicular, and axillary blocks all numb the “brachial plexus,” the network of nerves that supply the arm, forearm and hand (see Figure 1). The numbing medicine is injected above the collarbone, shallow to the lung and outside of the great vessels. This block is more widely used than in the past because newer technologies have made it safer. It provides anesthesia to the upper arm, the elbow, the wrist and the hand. The numbing medicine is injected under the armpit (the axilla). This generally provides good anesthesia for hand, wrist, forearm, and elbow surgery. The numbing medicine is injected towards the brachial plexus between the scalene muscles, which are at the base of the neck above the collarbone (clavicle). This type of regional anesthesia provides good anesthesia for wrist, forearm, upper arm, and often shoulder surgery. The numbing medication is injected towards the brachial plexus below the collarbone (clavicle). This generally provides good anesthesia for wrist, forearm, and elbow surgery. Figure 1. Diagram of the regional blocks used to numb the nerves in the arm. The numbing medicine is injected through an IV line in the arm being operated on, with a tourniquet around the upper part of your arm to hold the medicine in the arm, preventing it from leaking out to the rest of your body. This type of block is useful for short procedures such as carpal tunnel surgery. The numbing medicine is injected near the nerves at the wrist (median, ulnar) to numb the hand and fingers. The numbing medicine is injected after surgery to make you more comfortable, or after one of the blocks above has been performed, in order to complete your anesthesia. General anesthesia is when you are put to sleep for your surgery. Newer medications and techniques make side effects such as nausea, dizziness, and drowsiness less likely than they used to be, although they can still occur. General anesthesia may be used either instead of or in addition to a nerve block.